For 10 years we have been working for the international tourism and foreign investment in Colombia, providing support to national businessmen and implementing services that facilitate the design and execution of their strategy. This work has been rewarded with the recognition by national and foreign entities. 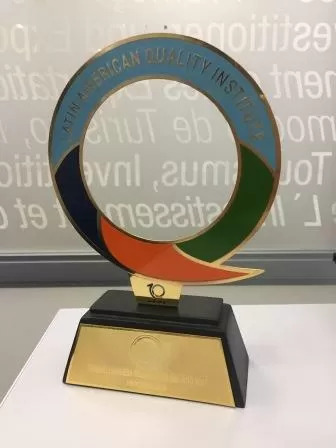 Colombian Company Of The Year: Recognition granted by Latin America Quality Institute to ProColombia for its good practices in Total Quality, Corporate Social Responsibility and Sustainable Development. PROCOLOMBIA ranked number 5 among the best companies to work in Colombia with more than 500 employees and is the first and it is the first public sector company located in the top 10 places in the ranking published by Great Place to Work Colombia. In 2012, it was ranked 15th. PROCOLOMBIA was recognized in the “fDi’s IPA Innovation Awards 2013” by Financial Times in the category “Policy Advocacy”, for its contribution in improving the investment climate in the country. South American Hotel and Tourism Investment Conference (SAHIC) granted the recognition "Contribution to hospitality" to the work of PROCOLOMBIA for the attraction of hotel investment. PROCOLOMBIA was number 15 in the list of the Best Companies to work in Colombia with up to 500 employees, from Great Place to Work Institute Colombia, it was the only government company. The Intelligence Unit of the Financial Times recognized PROCOLOMBIA's digital strategy as the most innovative in Latin America. According to the measurement, PROCOLOMBIA has the best digital strategy for the promotion of investment in South America and the second best strategy in social networks. Portafolio Awards 2012, PROCOLOMBIA was a finalist in the category of Customer Service. Jim Woodman Award for the outstanding contribution of the entity in the tourist promotion of Colombia in the United States, given to PROCOLOMBIA by the Tourism Association of Central and South America (SATA, for its acronym in English). CropLife Award - Colombia 2011. Recognition to PROCOLOMBIA for the results of the campaign “Colombia, the only risk is wanting to stay”. Gran Cruz of Cotelco - Colombia 2010. The Vice Presidency of Tourism received the award in the Comendador degree, the highest distinction granted by the Colombian hotel industry to companies and individuals who have served the country and the national tourism sector. Revealing Destiny - Brasil 2009. Revealing Destiny - Brasil 2009. Place 16 among 181 national agencies in charge of foreign investment. According to a World Bank study. Best state website - Colombia 2009. The official tourism portal of PROCOLOMBIA, www.colombia.travel, received this award in the "Colombia en Línea 2009" awards. PROCOLOMBIA Rreceived recognition for the creation and implementation of the National System of Administrative Obstacles to Investment, SINOI. La Rosa de los Vientos ACOPET - Colombia 2008. Prize awarded as the best government agency promoting Tourism in the country. Most outstanding entity in the development of Online Government - Colombia 2008. Recognition given to PROCOLOMBIA by ANDICOM (International Telecommunications Congress). FENALCO Awards - Colombia 2008. The entity received recognition for the campaign of Colombia is Passion by the National Federation of Merchants. Portafolio Award - Colombia 2007. Special mention in the Human Resource Management category. Great Place to Work - United States 2007.Position 20 on the list of best places to work. Leading agency in the provision of investment information.Prize given to PROCOLOMBIA in recognition of its good practices in "finding the information needs of the Investor". American Design Awards - Estados Unidos 2006. The Country Brand received the award for excellence in communication and graphic design for the logo and design of the Colombia Es Pasión campaign. Best State Internet Site - Colombia 2006. Online Colombia Awards. Great Place to Work - United States 2006.Position 19, PROCOLOMBIA is the only state entity in the list of best companies to work for in Colombia. International Children's Fashion Exhibition - Colombia 2005. PROCOLOMBIA Bucaramanga was honored for its constant collaboration with the export guild and especially for its support of the International Children's Fashion Exhibition, EIMI, for the benefit of Santanderean exporters. World TPO Awards 2004 - Switzerland 2004. Winner, prize awarded in Malta. Fourth place among 82 government entities in the world - United Kingdom 2004. Agile Government Study, conducted by the British firm AT Kerney and The Economist magazine. Prize Grand Prix - Russia 2004. The company Jaroma Ltda., Supported by PROCOLOMBIA, received this award for the best quality of flower and decorative product within the framework of the international fair Expoflower 2004.